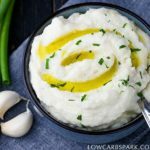 Creamy cauliflower mashed potatoes is a delicious low carb alternative to regular mashed potatoes. With only 5 ingredients you can enjoy a smooth and silky low in carbs vegetable side dish. When I first heard about substituting the cauliflower for potatoes, I was as skeptical as before trying fried radishes. People were going crazy for how delicious the mashed cauliflower is, and I couldn’t believe until I tried it myself. And, I was really impressed with the texture and taste. While it’s definitely a fantastic low carb substitute, it is not 100% identical with the classic mashed potatoes. Will I ever eat real mashed potatoes? For the moment I’m super happy with eating healthy cauliflower mash as it’s insanely delicious and healthy. Also, easy to make. Even though potatoes itself are low in calories, they are high in carbs. A medium potato has about 100 grams and 17 grams of carbs. The same quantity of cauliflower provides 5 grams of carbs. I hope you’ll try the recipe because it’s so worth it and it will instantly become your favorite side dish. Cauliflower is such a versatile vegetable. Have you ever tried cauliflower rice? It’s insanely easy to make and very tasty. 1. Cut the cauliflower into florets and cook in a large pot filled with for about 10 minutes or until fork tender. 2. Drain the water and let the cauliflower cool for a few minutes because you don’t want to burn your hand in the next step (safety first). 3. IMPORTANT STEP. DO NOT SKIP. To get the creamiest texture you have to get as much moisture as possible out of the cauliflower. To do this use a clean kitchen towel. Dump the steamed cauliflower florets onto a clean towel and wring with all your muscles as much water as possible. 4. Using a food processor or a hand blender combine the cauliflower, garlic and the rest of the amazingly delicious seasonings until fluffy and creamy. The instructions are the same: boil the cauliflower and the take out the moisture. Blend all the ingredients until the mashed cauliflower is smooth. If the mixture too thick, add some unsweetened almond milk and blend again. How to serve mashed cauliflower? 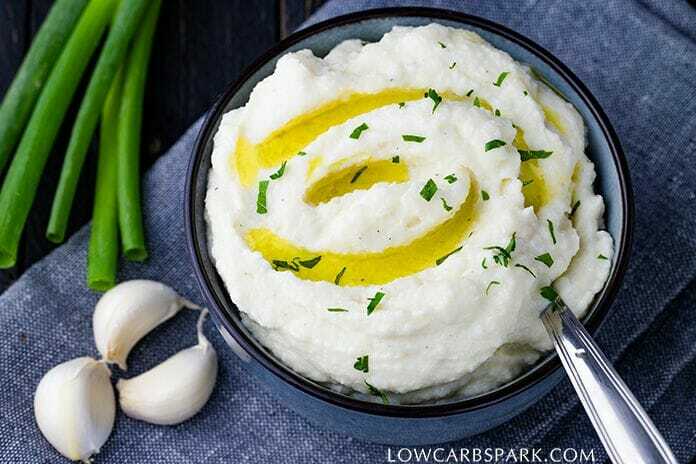 Cauliflower Mashed Potatoes is a recipe that very tasty on its own but amazing when enjoyed with other foods. My favorite way to serve the cauliflower mashed is with different roasted meats. Can I make cauliflower mashed potatoes without a food processor? Yes, it’s possible to make cauliflower mashed potatoes without a food processor. If you have a blender or a hand mixer it will work perfectly fine delivering you that creamy smooth texture. Using a potato masher will not work and will let you sad and crying for not heaving delicious creamy cauliflower mashed potatoes. 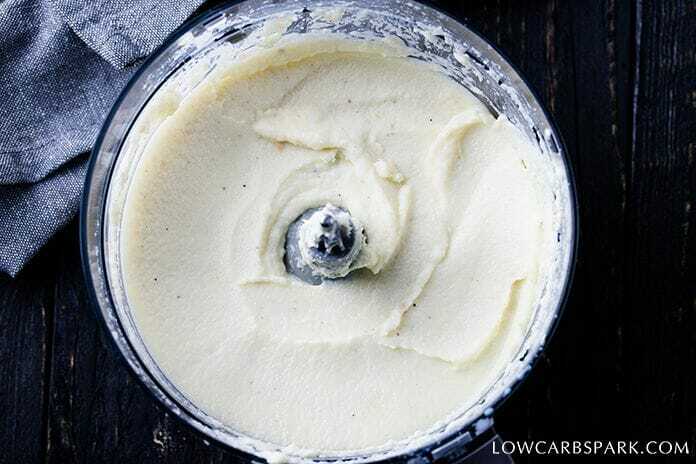 How to make cauliflower mashed potatoes vegan or paleo? 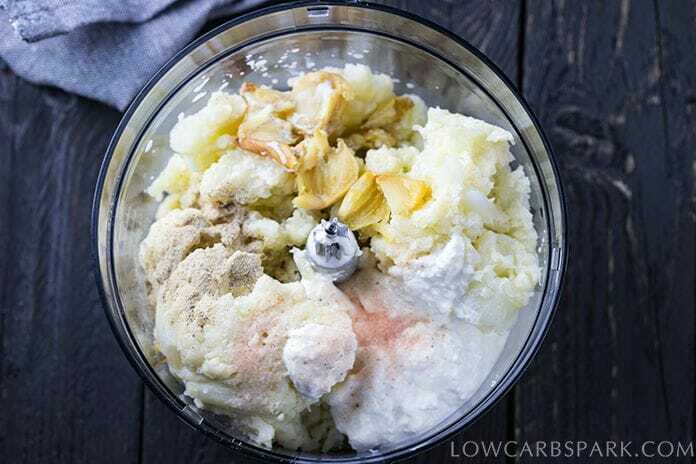 To make paleo or vegan cauliflower mashed potatoes, replace the cottage cheese with coconut cream and add one or two tablespoons of nutritional yeast. Adjust the roasted garlic, seasonings and blend until smooth and creamy. replaced potatoes with cauliflower (which is high in fiber, lower in calories and carbs than potatoes). 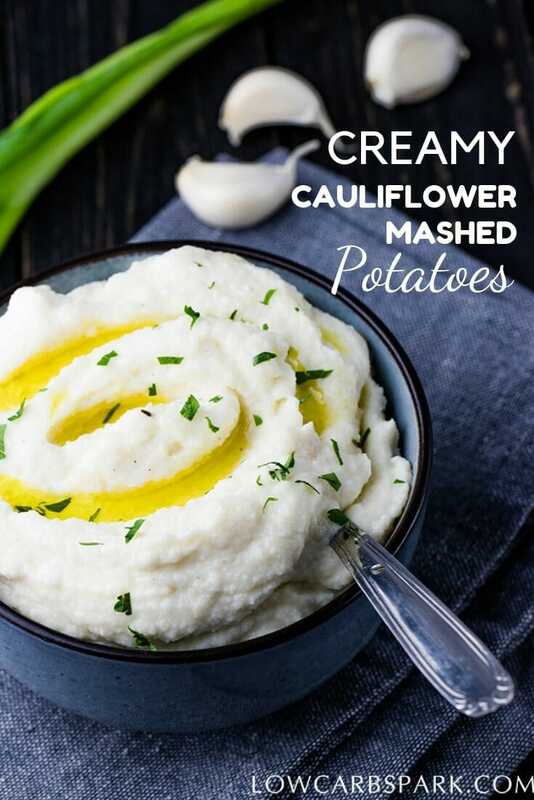 Making these substitutions will help you make mashed cauliflower that is low in calories, carbs and very healthy. Keep the cauliflower mashed potatoes in the refrigerator for up to 3 days. 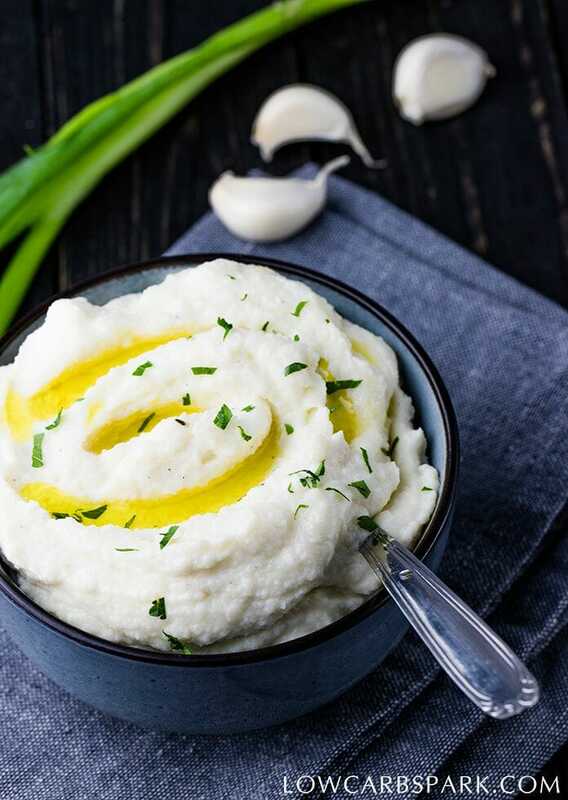 I love to serve it with a drizzle of extra virgin olive oil and freshly diced spring onion, but there are tons of options on how to serve mashed cauliflower. Even if you go for the lighter version or you decide to add butter and sour cream the options are endless. Cauliflower mashed potatoes are the best alternative to regular mashed potatoes. It's effortless to make, low in calories, low in carbs and needs only 5 ingredients. It's very simple to transform it into a vegan or paleo-friendly recipe. Start by roasting the garlic at 400F / 200C covered with aluminum foil. Cook for 40 minutes or until the garlic is very soft. If you don't have that much time you can use garlic powder to taste, but I prefer the roasted garlic cauliflower mashed potatoes better. Boil the cauliflower florets for about 10 minutes or until fork tender. Let them cool down for a few minutes until proceeding to the next step. Wrap the cauliflower in a clean kitchen towel and squeeze as much moisture as possible from the cauliflower. Add all the ingredients in a food processor and blend until smooth. Scrape the sides if needed to make sure it's creamy and well mashed. Add more or less garlic depending on your taste. If the mashed cauliflower is too thick add more almond milk until desired consistency. Serve hot with your favorite toppings.